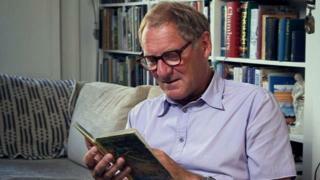 Poet Sir Andrew Motion is to leave Britain for a new job in the US, saying being known as a former poet laureate in the UK can be "suffocating". He will become professor of the arts at Johns Hopkins University in Baltimore. Sir Andrew said: "I feel I'm spending roughly half my time hiding in plain sight because I used to be something. "And the other half of the time I feel still so hard pressed to the national bosom that I'm suffocating. So I'd quite like to go and live in America." Sir Andrew, who was poet laureate between 1999-2009, was the first to retire rather than keep the title until death. He will also stand down as president of the Campaign to Protect Rural England, for which he has campaigned about issues such as litter, wind farms and building on the green belt. Speaking at the Imperial War Museum North in Manchester, he told an audience his new job is "amazingly interesting". He said: "In a nutshell, I'm 62, I love England, so I'm not going in a snarly way at all, but I sort of figure I know what's going to happen, more or less, if I stay here for the next 10 years. "And I think I would rather go somewhere where I don't quite know what's going to happen." Sir Andrew's successor as poet laureate was Carol Ann Duffy, who has been criticised by some in the press for not composing a poem to mark the birth of Princess Charlotte of Cambridge. Speaking about his time in the post, Sir Andrew said: "I'm not going to say this in a disrespectful way, but I did spend 10 years feeling quite often that I was being asked to write about things which I had no strong feeling about. And that's not easy. "And I don't mean any disrespect. I signed up to do it, I was pleased to do it, [and] honoured to do it." He will move to Baltimore in July. Quoting TS Eliot, he said: "Old men should be explorers... That's what I think." He will follow the path taken by British synthpop pioneer Thomas Dolby, who was made Johns Hopkins University's first Homewood Professor of the Arts last year. Sir Andrew said he had watched recent unrest in Baltimore following the death of Freddie Gray while in police custody "very interestedly and sympathetically". The city "did something amazing" by charging six police officers in relation to the man's death, he added. "Of course what happens next is incredibly important but they've started very well in this process of, I hope, putting it back together. So it's going to be very interesting." Sir Andrew was speaking at the Imperial War Museum North after the first public reading of a new poem inspired by the atomic bombs in Hiroshima and Nagasaki in 1945.